These words, spoken by a student I saw recently, gave me pause. They were talking about confidence – or at least the appearance of confidence – in this instance pertaining to the context of a job interview. When you’re wrong, you’re right. It’s not what you say that matters, but how you say it. You could be making something up on the spot, and be totally wrong on whatever it is you’re talking about, but if you appear confident in what you’re saying, you’re more likely to be seen as right. What exactly is confidence, and how do we get more of it? I’d like to make a distinction between what I see as different kinds of confidence. There’s confidence that’s similar to a personality trait, deriving from an overall sense of self-esteem that is fairly constant; and there’s confidence that comes from performing certain tasks repeatedly such that you become more and more certain that you will be able to perform those tasks effectively, which obviously fluctuates significantly according to the nature of the situation. For the sake of this post, we’ll call these two confidences “trait confidence” and “task confidence.” Let’s think of them as existing along two separate continua. I’ve created a crude diagram depicting this spectrum below, where the vertical axis represents trait confidence, and the horizontal axis represents task confidence. 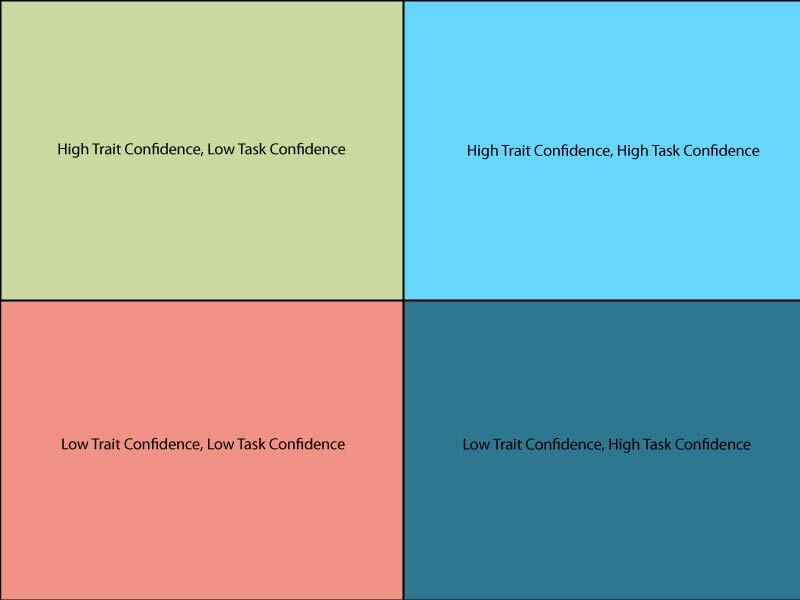 I don’t really think it’s as simple as the graph above would suggest, but if we’re talking about where confidence comes from, I think these different quadrants might be helpful. So, according to my theory, your overall level of confidence in any given situation is going to be dependent on your overall tendency to be confident (trait confidence) combined with your sense of efficacy in that specific situation (task confidence). It’s obvious that the place to be is in the top right quadrant, where you’re generally confident in your abilities and outlook, and you feel well practised in the task that you’re accomplishing. Barring that possibility, you either want to be in the top left quadrant or the bottom right quadrant, where you’re high in one kind of confidence but not the other. The place you really don’t want to be is obviously in that lonely square in the bottom left, without any confidence whatsoever. How do we become more confident? The seemingly intuitive thing to do is to practice. If we take into account our model of confidence above, however, we see that practising a task likely only improves your confidence as it applies to that task. I’m not convinced that becoming really skilled at playing chess, for example, will in and of itself make you a more confident person outside of that context. So, the answer to the above question seems to be, as my supervisor so likes to say: “it depends.” If you want to feel more confident during job interviews, it makes sense to do lots of practice and try to go to as many interviews as possible, just as playing lots of chess makes sense if you want to be a more confident chess player. Simply by becoming more familiar with the process, and learning from your experiences and mistakes, you will become more confident in your abilities over time. But what about that other kind of confidence? You know when people have it – they just seem to carry it around with them wherever they go. They inspire trust. They don’t seem to really ever get fazed by anything. They’re Confident, with a capital C.
How can you be more like that? I believe the first step lies in something that humanistic psychologists have long been calling the self-actualization tendency. In essence, self-actualization is a fictional end state (we never get there, that’s why it’s a tendency) in which a person has totally fulfilled all of their humanly needs (starting with survival needs and escalating hierarchically to more spiritual and collective needs), and meaningful growth as a person is no longer possible or even desired. 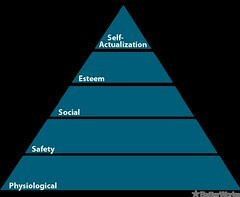 Again, according to humanist psychology, the tendency to self-actualize is innate and automatic. We’re already trying to do it, all of us, from the moment we are born. The problem is that we encounter barriers to our growth, and we spend most of our lives figuring out ways of getting around them. So, what does this have to do with confidence? Sounds like a good topic to delve deeper into next week, doesn’t it?